What Is A Ninja Blender? What is a ninja blender? Good question with lots of answers. The Ninja Blender brand is part of SharkNinja Operating LLC, the maker of Shark, Ninja, Ninja Chef, Nutri Ninja and Ninja Coffee Bar products. It began in 1995 in Montreal, QC, Canada and has since moved to Needham, Massachusetts, U.S.A. Current CEO is Mark Rosenzweig. This is not meant to be a comprehensive list of all Ninja products. For more information visit the Ninja Kitchen website by clicking here. 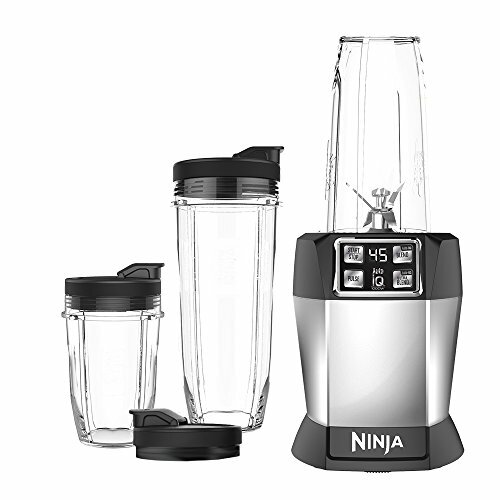 Ninja makes 2 out of the 4 basic types of blenders, the personal and the countertop blenders. Learn more about the basic types of blender on my Blenders page. The basic personal blender is the Nutri Ninja Auto iQ (model #s BL480D, BL481, BL482, BL490). Want to know more? Click the image below to visit Amazon and find out about the great features of this fine blender. There are two basic models of the countertop blender i.e. Ninja Chef high-speed (model # CT805) and Ninja Chef DUO high-speed (model #s CT810 & CT815A). Click the image below to learn more about this blender available on Amazon. In addition, there are three basic multifunction Intelli-Sense blender models; the Duo (model #s CT640C & CT641), the Intelli-Sense Kitchen Systems (model #s CT680, CT680A, CT680SS & CT680W) and the Intelli-Sense Kitchen System with Auto-Spiralizer (model # CT682SP) that can perform as food processors, food spiralizers as well as personal or countertop blenders all on one power base depending on the set of accessories supplied. Auto-iQ is a technology that combines timed pulsing, blending and pausing program patterns to take the guesswork out of blending for you. Click the following link to read my detailed review of the Ninja CT682SP Intelli-Sense KItchen System with Auto-Spiralizer. A personal blender is one that consists of a power base that houses the motor along with a blender jar and a blade assembly. The jar and blade assembly are inverted during the blending process. Most blender jars come with lids allowing them to be used as a portable cup or mug. All Nutri Ninja personal blender models are rated at 900 watts and designed for maximum nutrient and vitamin extraction. A countertop blender consists of a power base unit and a blending jar with detachable blending blade assembly. 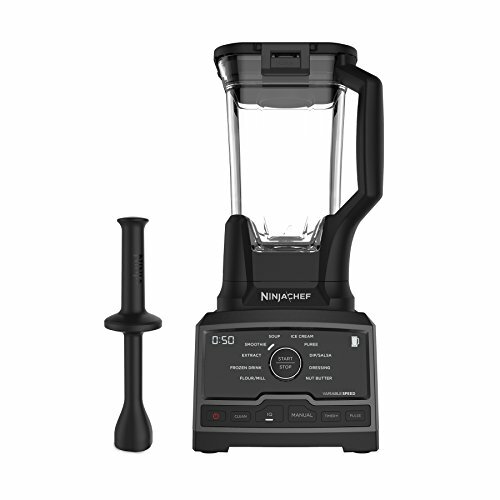 The Ninja Chef blenders have powerful 1500-watt motors and a next-generation high-speed blade design. They are controlled by 10 pre-set Auto iQ programs and a wide variable speed range. Manual programs are Pulse and Manual speed levels 1-10. Each comes with a 72 oz. pitcher. The DUO also comes with a 24 oz. single-serve cup and spout lid. Also, included with both models is a 50-recipe Inspiration Guidebook. All Ninja Intelli-Sense Blenders have 1200 watts of power, Smart Vessel Recognition, and easy to clean touchscreen display. With Smart Vessel Recognition, the touchscreen automatically displays the menu of pre-set programs appropriate to the attached vessel. Programs combine blending, pulsing and pausing patterns to ensure the best results. The Ninja Intelli-Sense Kitchen Systems and Kitchen System with Auto-Spiralizer are precision processor controlled. The Kitchen System with Auto-Spiralizer features an Auto-Spiralizer & 2 Discs. Also included with the Kitchen Systems is 1 x 24-oz. single-serve cup with spout lid. The Duo comes with 2 x 24-oz. single-serve up with 2 spout lids. Manual programs available on all models are Low, High and Pulse. A 35-Recipe Inspiration Guide is included with all Kitchen System packages. Do you own any of these Ninja blenders? If so, I’d like to hear your opinions about any of them. Just got the CT680SS and we were wondering if it can make cashew milk or nut butters, and if the different spaghetti or angel hair blades that work on the CT680W Will Work on the CT680SS? I guess what we would like to know is if the SS and W designations are about color or function and accessory capability. Thanks! Thanks for taking the time to visit and leave your questions. To be honest, I haven’t tried to make nut butter or cashew milk with the CT680 but the CT682 blender makes almond butter without any problem. Since the design and power of both are pretty much the same, the CT680 should be able to handle cashew milk or nut butter well. Spare parts and accessories seem to differ between the models, but I’m not sure why. All the main components are otherwise identical. Unfortunately, the Ninjakitchen website does not have enough information to confirm that the spaghetti or angel hair blades will work on both models. My guess would be yes. Hope you enjoy your new Ninja CT680SS. Thank you for your post on Ninja Blenders. I have seen these advertised in stores. I was thinking of buying a ninja blender myself. This article actually informed me enough to make an intelligent decision. The information is so relevant in this article. I know what I want and what to look for when I go to the store to buy. Thanks for the comment. Glad I was able to help you make a decision. If you want to save time, buy online by clicking on the popups under the product images. Amazon has some great deals, often less than what you would spend at the store. Many thanks for the informative Ninja blender review. These should be a very important part of everyone’s kitchen as just by looking at one of these devices….healthy living jumps out at us. As we are living in a intellictual world today, I see that these blenders are also keeping up with the latest technology. The Ninja Intelli Sense blender is a really updated modern fantastic utensil. It ticks all the boxes in as far what we can do with this blender, pricewise, its not overly expensive, so it would be my choice if I was in the market for one of these. Thanks for the comments. Yes, blenders have become a big part of the world today. Saving time in the kitchen but also making healthy food choices is very important. The Ninja Intelli-Sense Kitchen Systems take the guesswork out of blending, smoothie making, food processing and making salads attractive with the Spiralizer attachment. If this is too much appliance for you, have a look at other choices that might be more appropriate. Visit my smallkitchenappliancesforyou.com/blenders page to learn more. Thank you for great information about the Ninja blenders. It has been on my bucket list to buy after I needed to stop using my last blenders. Special I like the Ninja Chef Countertop Blenders a lot.Not at least their 10 pre-set Auto iQ programs which made, I believe but I didn´t have that on my last blender, life much easier. Is it difficult to clean it? Thanks for the comment. It is actually easy to clean any blender, just add water and a couple of drops of dish soap to the blender jar and blend on “high” for a minute. Do this as soon as possible after using the blender so the contents don’t have a chance to dry out. Then just rinse well under the hot water tap and air dry. The soap and hot water will sanitize the vessel well enough between uses. However, at least once a week disassemble the blade assembly from the jar and clean in the dishwasher, check owners manual to ensure they are dishwasher-safe otherwise hand wash, to make sure you get any trapped food particles out from between the jar and blade assembly.